Jenean and I just returned from our first adventure in Portugal. What a country! We can’t wait to return. Discovering a new place and planning for future tours was our first priority. A nice bonus was the ability to make purchases for our European gifts shop in Sarasota, Florida. And a third bonus to going to the Algarve and Alentejo regions in the early part of July was that it was before the main crush of tourists arrive and yet, beautifully warm and tropical. We had escaped a horrible ‘summer’ in Germany. It seems like all it has done since the last part of June has been rain, rain and more rain. Cold, too, with highs only in the 60s. The Algarve and what we explored in the Alentejo regions were such wonderful surprises in so many ways; far more modern and organized than I had imagined. Wonderful food, people, beaches, and amazing antiquities — from megalithic and Roman sites to remnants of the Moorish influence and dominion of the area for six centuries, ending in the 13th Century. In addition, we found some great accommodations — some of the ones that we scouted are so wonderful that we can’t wait to get back to those places with guests. 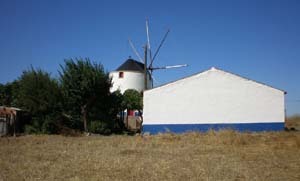 We found a little self-catering apartment hotel just 30 minutes drive from Faro Airport, which serves southern Portugal. We fell in love with the Vila do Ouro immediately. We had only booked for two nights of our five-night stay but after just a couple of hours of relaxing by the pool and enjoying our little ‘H?ºttli’ (cabin) we changed the reservation for all five nights. We decided to do daytrips from here and concentrate our scouting on the Algarve and Alentejo regions rather than try to run all over Portugal in such a short amount of time. It was the right decision, allowing us to do our work in the early part of the day and then retire to the pool by 4:00 for sunbathing, swimming and partaking of cold local beers from the Vila do Ouro’s honor bar. This was a formula for total relaxation and taking in the atmosphere of the region that we wish we could convince more of our guests to do, rather than trying to pack too much into too little time. Back in Germany now since the 6th, we’re missing the balmy temperatures, the amazing countryside, quaint villages and small towns and the excellent hospitality of the Algarve and Alentejo.